Should you buy a stronger and lighter carbon fiber tripod over a cheaper aluminum one? Tripods are also commonly used to steady the camera, reducing involuntary camera shake caused by shooting handheld at slow shutter speeds, or simply to give the photographer the ability to tweak composition more accurately than a handheld shot would allow. 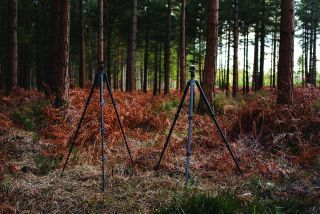 Tripods were traditionally made from aluminum, but more recently carbon fiber tripods have become popular, being touted as stronger and lighter than their metallic counterparts. And while carbon fiber is the more expensive material, prices have come down over recent years. When we refer to tripod ‘strength’ we’re essentially talking about stiffness – resistance to compression when a load is placed on top. Without getting overly technical, stiffness is measured in gigapascals (GPa), and aluminum scores 69 compared to around 181 for carbon fiber. So for the same diameter tripod leg, carbon fiber is much stronger, and because the material is less dense, it’s far lighter too. That’s not quite the full story; because carbon fiber is manufactured in a highly technical process, and mixed with a resin to give it its shape, there are different grades of quality, but generally speaking it’s stronger and lighter. And it’s only the leg tubes that are made of carbon fiber; joins between leg sections and the head assembly still require metal components, meaning a typical weight saving of around 20-30% over an aluminum model. Let’s take a closer look at what you should be considering when buying a aluminum or carbon fiber tripod. Aluminum tripods are actually created from an aluminum alloy, and while not the strongest metal available, it is relatively strong for its weight. It also has the benefit of being fairly malleable, meaning that if you manage to damage it via impact, it will more likely become bent rather than completely broken, and therefore still be usable. Both types of tripod come with a wide range of price tags, depending on how tall they extend and small they fold, load rating, quality and features. Aluminum is typically 30-50% cheaper than a comparable carbon fiber model, so it’s not just a case of how light you want your tripod, it’s also how much lighter you want your wallet to be.